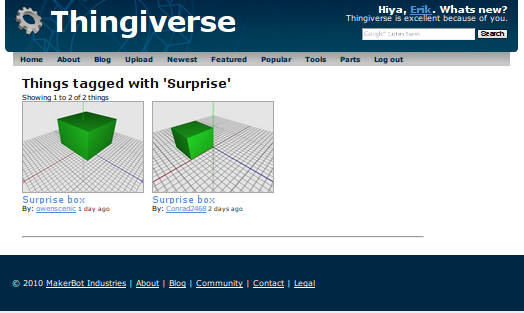 There is an interesting phenomena on Thingiverse lately: Surprise Boxes! It looks like an ordinary box right? But the secret is that there will be something 3D printed inside the box! What will it be? You wonâ€™t know until you make it become a reality on your MakerBot or other 3D printer! The way it works is that it is a box with something special inside, but to find out what it is, you have to make itâ€¦ and even then only you will know whatâ€™s inside because the surprise gets sealed in! What a awesome idea! This is so cool. What an innovative idea by Conrad2468 and itâ€™s already been repeated by Owenscenic!